Using an Instant Pot or other electric pressure cooker makes this soup very easy to make (but is not essential). 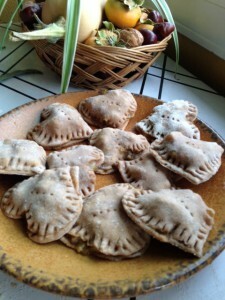 Check out this blog post from Kind Veggie for a great instructional video. Sumac is a spice that is very popular in Middle Eastern cooking. It gives dishes a tangy taste. Look for it in Middle Eastern stores, but if you can’t find it, lemon juice is an acceptable substitute. 1) In a pressure cooker, sauté the onion and garlic in 1/2 cup of the water until the onion is soft, about 5 minutes. Add the seasonings and cook for 1 minute. Add the lentils and the remaining water. Seal the pressure cooker and bring it up to high pressure. Cook at high pressure for 4 minutes; then remove from heat and allow pressure to come down naturally. 2) Add the parsley and salt (if using). Add additional water if the soup is too thick. If the lentils are not completely tender, replace the lid (but don’t lock it) and cook until they are done. Just before serving, stir in the lemon juice or sprinkle each bowl of soup with a little sumac. Serves 6. Nutrition (per serving): 193 calories, 10 calories from fat, 1.3g total fat, 0mg cholesterol, 13.6mg sodium, 391mg potassium, 34.6g carbohydrates, 6.4g fiber, 2.4g sugar, 12.8g protein, 3.2 points. When I make my red lentil dishes in the slow cooker, I cook them for about 7-8 hours on low. Could I make this in a crock pot? How long would you recommend if so? I think this will be on the menu tonight. Maybe with some added veggies. I love the colour! Thanks Susan. You’re always so helpful! A 5 or 6 quart pressure cooker should be big enough for this. Feeling under the weather today and searched for a good lentil recipe and I found this one I would give it 5 stars for sure. Lots of wonderful healing herbs, easy to make, and to be honest I feel better after a couple of bowls. I will be making this again with a nice side of fresh Naan. Where is the fat coming from in this recipe? You list 1.3 grams of fat but I don’t see fat in the ingredients. I can’t have any fat in my diet – heart disease – and I can’t make this soup if it has fat in it. Please let me know, I’d really like to tty it. Made this today, love the idea about doing it in the pressure cooker, was sooo quick! I think that’s the reason it retains the water. If I had cooked this in a normal pot a lot of the water would have evaporated. I added extra ground coriander plus dried coriander leaves was also out of onions but had some dried ones and it did the trick. To thicken it (only ever so slightly) I added some cornflour. Very tasty….it seems to me like a dal. Very nice with a tomato. Kathy, I haven’t doubled it, but it should double just fine. I would probably start with a little less than double the water–you can always add more as needed. I do not use a pressure cooker. Use stock pot stove top. has anyone tried it with the spinach yet? I was curious what people thought. I made this the other night and it was great, I’m making it again tonight. I’m new to this board and I just got a pressure cooker for Christmas and have been having fun with it ever since but only bean recipes it’s so hard to find vegetarian cookbooks that I like as it is let alone pressure cooking still getting used to it. can’t wait to try this! sounds yummy. I love lentils so was looking forward to this…wasn’t disappointed either! I added cauliflower and mushrooms and served it with rice in a bowl. Delicious! My husband loved it too. 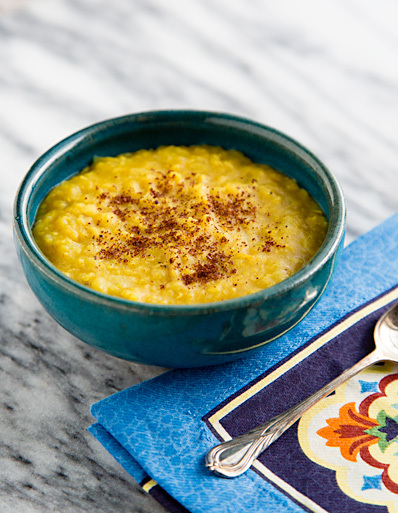 I have always been craving dhal- thank you for this easy and very delicious dish that’ll satisfy that craving! (after it has cooked, i throw it on top of brown rice and throw in fresh spinach to let it wilt) Very enjoyable! Hey! I’m slowly adopting a vegan diet and I dig Indian food, so when I saw lentil soup, I was excited! I’ve just added the nutritional info at the bottom of the recipe. I based it on 6 servings because I couldn’t remember exactly how much it made, so your servings may be bigger or smaller than that. I made this for my husband today and turned out delicious. He hasnt had it yet but I know he too will love it. My husband is eating a heart healthy diet and I just would like to know how heart healthy this recipe really is. Thanks a bunch! That’s strange. It comes out very thick for me. I often have to add more water just to make it more soupy. I guess it all depends on your lentils and how high a temp you cook it at. The pic made it look like the soup was more of a puree – thicker more than thinner ya know? But the 5 1/2 cups of water made it a bit thinner than expected. The spices definitely makes this soup different. this was really yummy, I was thinking it could be used as a curry sauce in a veg curry and rice. My husband is from Lebanon and says that to his knowledge, this is not Middle Eastern per se, however with those spices really fits in with Indian fare. As for the recipe, it’s yummy! No matter what it’s called, it’s really good. It’s a change from the regular lentil soup I make. Spinach would be a great addition. Might try with 10 ounce frozen chopped spinach added. Would that kill it? Equally yummy with added zucchini and carrots or other vegetables you might have. I made this tonight and it was lovely. thank you!! i tried making this and it was gorgeous! 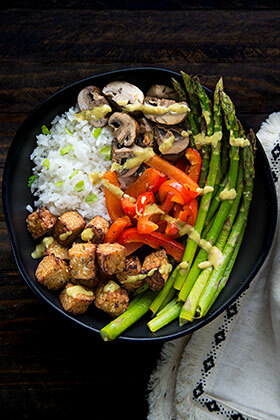 i’ve been taking part in veggie week and was looking for recipes to try, and this is great! This is so good, I made a half batch to test it out yesterday, and today I am making another full batch! Love it, thanks!